Yesterday – the eve of China’s National Day, which celebrates the founding of the People’s Republic of China – was entirely peaceful, with no police-protester confrontations. Yet that calm was also strange and unsettling. Where had all the police gone? Were they preparing for something to happen that night? I spent the day sleeping in, exhausted from writing my last post, and only woke up in the early afternoon. I spent the rest of the day at HKU, and only went out after 9pm to meet some folks at Admiralty. I was hoping to visit Causeway Bay and Wanchai at some point during the night, since those were occupation areas I hadn’t visited yet. Arriving at Admiralty was absolutely shocking. Each day the protesters have grown larger in size, and that night’s crowd was the biggest yet – it must have stretched over a mile. Check out my friend Aseem’s photo blog here for some truly spectacular images. The area was so packed that some people were asking others to please go to Causeway Bay or Wanchai because there were too many people in Admiralty! Yet it was amazing how well-ordered the crowd was, despite the appearance of chaos. In the open-air entrance to Admiralty MTR, people had taped up signs and strung tape across several pillars to create exit and entrance routes to ease the foot traffic in both directions; a few people were standing with signs also reading exit and entrance, and one girl’s sign had an arrow pointing in the direction of Wanchai. Admiralty still felt very much like people were waiting for something to happen, whereas Mong Kok had the feeling of simply existing in the streets and in the moment. (Again, I attribute this to simple geography; Admiralty is home to government offices, whereas Mong Kok is residential/commercial.) Yet there was no sign of police – even the raised walkway that had been blocked off by police on Sunday was open, and some people milled about Tamar Park. 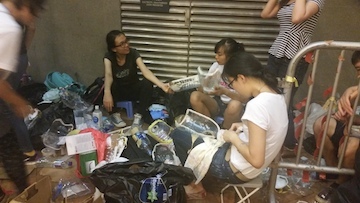 At the foot of the escalator to the walkway, a group of girls was making face masks from recycled plastic bottles. I also saw the first obvious sign of political graffiti in the “852 is dying” tag on the side of the escalator going to the Tamar Park walkway. For the third day of protests with tens of thousands of people participating, it’s quite impressive that this is pretty much the only graffiti that’s stayed so visible. People have also been tweeting photos of people removing graffiti (but some have the opposite reaction to graffiti as well). I think there’s a growing sense of community because of the leaderless nature of the protests. Though there are three Occupy Central founders and several well-known student leaders, they don’t – they are unable to – control the movements of the protesters. There’s this feeling of frustration with the Hong Kong government, and many signs write that CY Leung is not one of them – he is not a Hong Kong person, he is a Communist “wolf.” People want to defend their home, not destroy it, and so they won’t break windows in their own home but decorate it instead. Enough speculating for now. F and I walked through the crowd of protesters for a while, checking out the scene and getting a feel of the environment. I was also supposed to meet up with Aseem, but the phone service was so bad in the area because of the sheer number of people in that area. Finally we found each other, and as midnight approached, F decided to go home before the last train departed. She had a few friends who were planning to spend the night in Wanchai, so I told her good luck for them. Aseem and I walked about a bit more, but he also had to grab the MTR home, so we left the area around 1 in the morning. It feels like all the streets from Wanchai to Central are closed – even if there aren’t scores of people on them, they’re simply blocked off and empty of traffic. I started off on the 2+ mile-long walk home from Admiralty. The previous time I’d walked home that late, some cabs had refused to take me home (perhaps because I wasn’t going in the direction of the protests? ), so this time I just decided to walk. The streets are just so different now, filled with people rather than cars. The pollution in Hong Kong has actually decreased since the occupations began. I walked down a highway overpass, taking in the scene. On either side of the highway, groups of young people were sitting on the ground or standing. It reminded me so strongly of the way that the streets used to be occupied by the foreign domestic workers – except that now, the people sitting in public spaces were overtly claiming them as theirs. I passed by a building as the overpass sloped down that seemed horribly pathetic. “慶祝國慶 Celebrating the National Day, 1949-2014,” it said boldly. On the rails facing the sign, protesters had posted their own messages. The ones in white read, “We peace 我和平 – 你暴政 You riot.” The one in the middle called for CY Leung to step down, and the ones to the far right read, “The price of freedom is high. Always has been. And it’s a price I’m willing to pay. If I’m the only one, so be it. But I’m willing to bet I’m not.” A man in a cycling suit pulled up alongside the flyers, pausing his bike ride to tell his friend, Yeah, I rode the whole circuit. No, I’m not kidding! Statue Square and Chater Road were just bizarre. They were full of young, mostly ethnic Chinese kids, and they had truly marked the place as their own. On Chater Road, where just a few days ago there had been no sign at all of Occupy Central, there now stood a barricade made of metal and umbrellas. The road was packed tight with youth settling in for a long night. I also had to take this photo, just to commemorate the strangeness of it. This intersection is right about where I typically would take a bus home from Central, but that night it was completely blocked off. Upon reaching my block, I stopped in the Circle K and picked up some Yakult and cup noodles. A very satisfying night. *I want to add that in addition to all of the economic, political, and social threats that Hong Kong people feel from the mainland, there is also a symbolic threat in the form of bad feng shui (風水). I recall hearing about this from Patrick, who told me about a building that China had built shortly before the handover that people hated because it was shaped like a dagger, stabbing into the heart of Hong Kong. After looking at the odd tapered shape of the PLA Central Barracks, it only occurred to me today to Google exactly what building Patrick had referred to. Ever since it was completed, the governors of Hong Kong never lasted long and there was even one governor that was fired. The reason for the instability of the governors is due to the fact that the tower is located directly across from the Government House like a knife ready to slice a piece of cake. 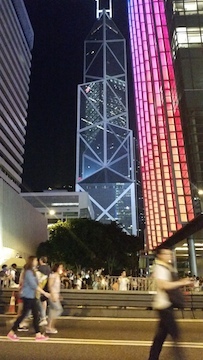 Not too long after the completion of the Bank of China Tower, the governor passed away; the following governor was fired and in the next term, the governor created many problems. The first executive of Hong Kong, Tung Chee-Hwa noted that the Government House had bad ‘Feng Shui’ and refused to live in the house. Look forward to reading what you have to say about the view of mainlanders from Hong Kong. I’m interested in the concept of civility as deployed here. It reminds me of the old controversy in Latin America between “civilization” and “barbarism” — and how cities (or, say, a city like Buenos Aires) is deemed superior to the all else. In Argentina and elsewhere, civilization was intertwined with positive views of Europe; I wonder to what extent a nostalgic vision of Britain is at play here. 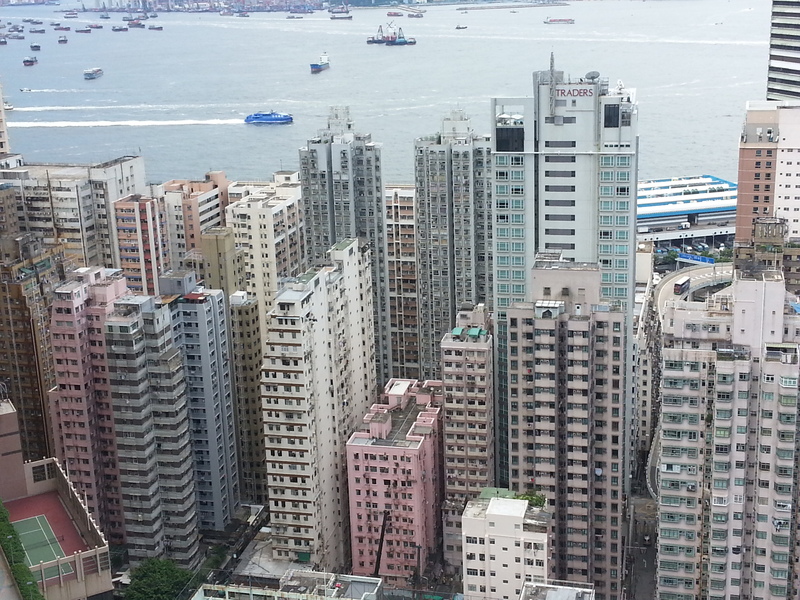 Hong Kong, then, would be the City par excellence, the site of civility (and civilization? ), where as the Mainland… You expressed some reservations about democracy earlier that I too share, though perhaps not to the extent you do. I wonder how Civility and Democracy can be reconciled given that the practice of democracy is messy, demands compromise, etc. Love your blog, Vivian — thank you so much for these detailed postings.